Last Friday, Starbucks rolled out it's newest coffee invention to its loyal masses. Refreshers™ are intended to be a delight for your taste buds as well as the ultimate thirst quencher and natural energy booster. 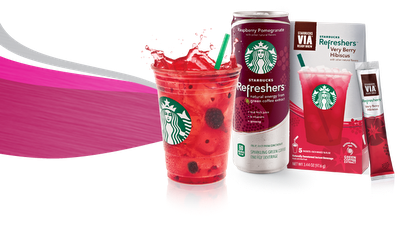 Unlike Starbucks' traditional coffee drinks, Refreshers™ contain green coffee extract, a natural source of energy that doesn't taste like coffee. Green coffee extract is essentially un-roasted Arabica coffee beans. Coffee gets its taste from the roasting process. Since the beans used in Refreshers™ aren't roasted, there's no coffee taste, but the energizing powers of coffee are still there. Refreshers™ are iced beverages that are available in 2 flavors: Cool Lime (with real lime) and Very Berry Hibiscus (with whole blackberries). They are light and are perfect for hot summer days when you want something that will both quench your thirst and taste good. I love the teas and non-coffee based drinks that Starbucks offers. So I was excited to try Refreshers™. Available in 3 forms (see image above), Refreshers™ are easy to grab on the go or to prepare in your own kitchen. I loved the Very Berry Hibiscus. I enjoyed the whole blackberries, and the flavor was fruity but not overbearing. However, the Cool Lime tasted like watered down cough syrup with a bad aftertaste of spicy Indian food. Yeah, strange. I was lucky to find a few samples out at my local Starbucks, and I'm glad that I did. I would've been disappointed to have spent money on a drink that I didn't like. I have since returned to purchase a tall Very Berry Hibiscus Refresher. I would recommend sticking with a tall rather than larger size. The drinks are potent in terms of taste. Anything larger than a tall is too much flavor. But overall, I have to say that Starbucks got it right yet again. No big surprise there.